Monday, Monday……….. it’s Monday in Maine! Starting this week, I’ll be doing a Monday feature called “It’s Monday in Maine”. Posts will be all about this amazing state, so I look forward to sharing beautiful Maine with you. When most people think of Maine, they think of lobsters, lighthouses and our rocky coast. And the Maine coast is both beautiful and rugged but there is so much more to Maine. It’s a very diverse state with lots of things to see and do. Bill’s Tractor Barn and John Deere B tractor are covered with snow after a winter snow storm in Sherman, Maine. 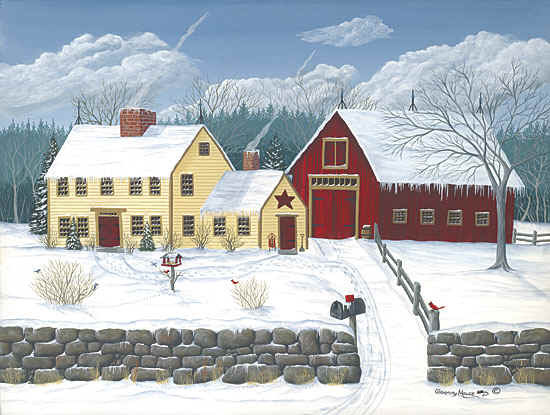 Right now, it’s winter in Maine, and in very northern Maine where I live,it has been a very cold winter with lots of snow. We have had a couple of blizzards in the last few weeks, and in December we had a devastating ice storm that left us without electric power for 5 days just a week before Christmas. It was like living in a third world country. Thank goodness we have a couple of wood-stoves for back up heat. I don’t want you to get the impression that I totally dislike winter. It is incredibly beautiful, and there are lots of fun things to do this time of year. Although we have had some very cold days with temps getting no higher than -4F and nights going down to -28F, those are the rarity and not the norm. So today I’d like to share the beauty here on our little farm and the wildness of some of snow storms. We have a 1400 foot driveway that takes us to a partially paved road that eventually connects with Route 158. In other words, we are out of the main stream, so when a major snowstorm is predicted we have to prepare to be snowed in for a few days. Although we have our own plow truck, a 4 wheel drive with a snow plow on it, we can’t always plow the driveway ourselves. 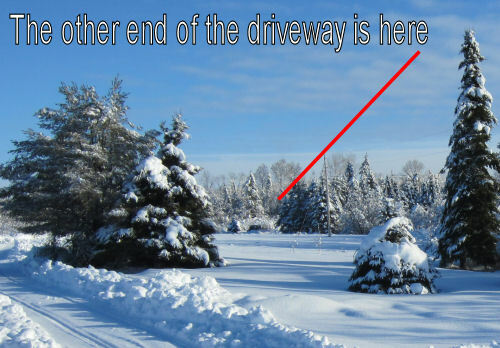 A lot of the time, the driveway drifts so full of snow that in places it is 4-5 feet deep. The old plow truck can’t move it. So we have to hire a contractor with heavy equipment to come in and dig us out. However, his first commitment is to the logging companies to keep their roads open for business so we are last on his list. That means that we are in here snowbound for up to 3 days. I always plan ahead and stock up at the grocery store. Actually it’s kind of fun! I do worry that we would be in big trouble if we needed an ambulance but other than that being cut off from the outside world isn’t all that bad. The storm is cleared and Bill has begun to plow. He has to work his way up to the Gallison Road to clear the driveway. That’s what winter is like near Baxter State Park in Maine. We are about 25 miles to the east of Mount Katahdin and Baxter State Park. 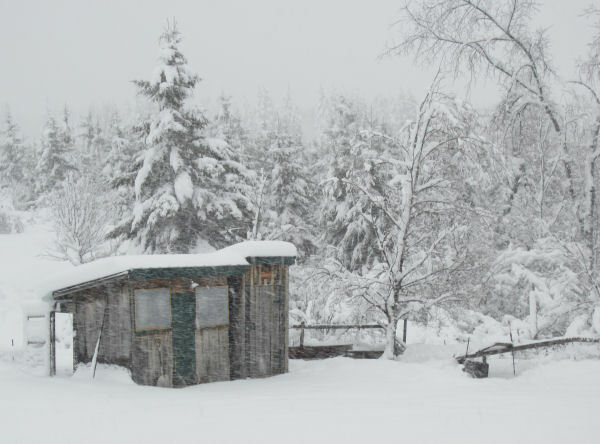 It’s very beautiful country but in the middle of a winter snowstorm, like the Blizzard of 2013 pictured below,it is a wild and wooly place to be. These trees are along the edge of our lawn at the edge of the forest. 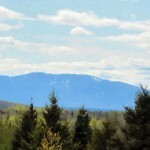 Beyond those trees is a spectacular view of Mount Katahdin when the weather is good. 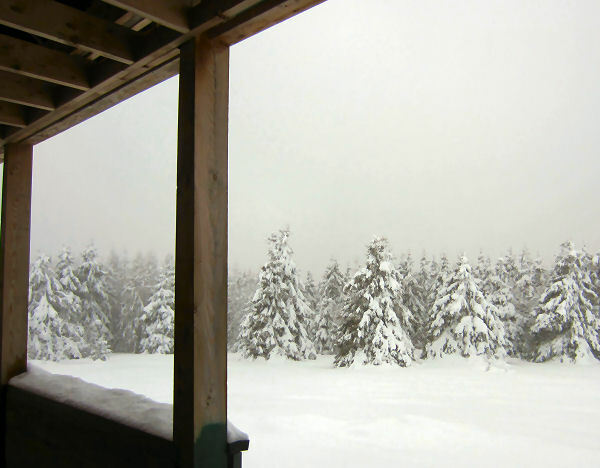 Standing on the front porch looking west in the height of the Blizzard of 2013 as the snow drifts in amongst the spruce trees at the edge of the lawn. 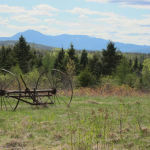 It isn’t an inviting trip but Bill’s girls must have their corn and water so he will have to trudge through the storm to see his biddies, on a farm near Mount Katahdin. The birds won’t be splashing in the birdbath today. The blizzard of 2013 left us about 18 inches of snow. 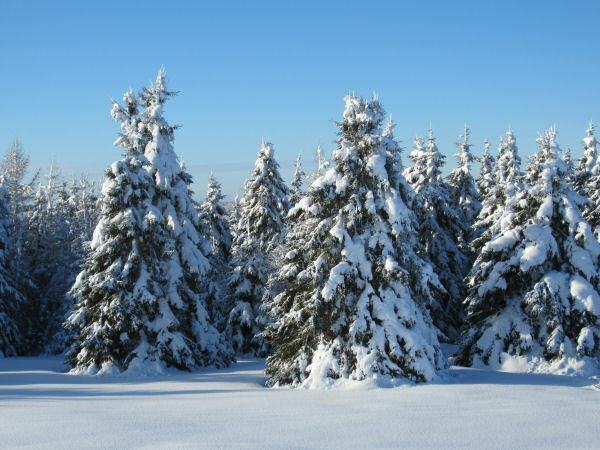 The trees are flocked with snow like a Christmas card in the Katahdin Valley in Sherman, Maine. Be sure to stop back next week for another “Monday In Maine”! Beautiful! What a great idea to share a piece of your home state. I have never visited Maine, but would love to! Thanks for sharing at A Humble Creation! Thank you, I’d be honored ! I love your photos! I’ve been to Maine and it is a beautiful state! Thanks for sharing your talent on The Creative HomeAcre Hop! Amazing! I actually shivered looking at those pics! Your state is beautiful. Good to have you link with me at GSIS! I saw you featured at Violet Imperfection and came to take a look. These blizzard sure left you with some pretty pictures! Such snowy beauty, at least from here. (Surely a different story when you’re the one shoveling it.) I’ve never been to Maine — or anywhere out east, for that matter — but would sure love to visit … in the fall! Thank you again for joining the GRAND Social! Delighted to have you join us! Sheryl, Congrats! You’ve been featured for this wonderful post on Simple & Sweet Fridays. Thanks for sharing. Have a wonderful weekend! Thanks for feature! I’m glad you enjoyed a visit to the “frozen north”. I always enjoy seeing where other bloggers are from. Beautiful! I’m so glad you’re doing these posts on Maine. My father’s entire family is from there…generations…and I’ve met NONE of them. I hope that one day I’ll get to get back there and see what our ancestral stomping grounds look like! I have never been to Maine, but it is on my ‘want to’ list. Beautiful snow pics! We have had an unusally cold Winter with lots of snow here in UT also. Thanks for sharing with Share Your Cup. As a child, I fell in love with Maine on a family vacation. 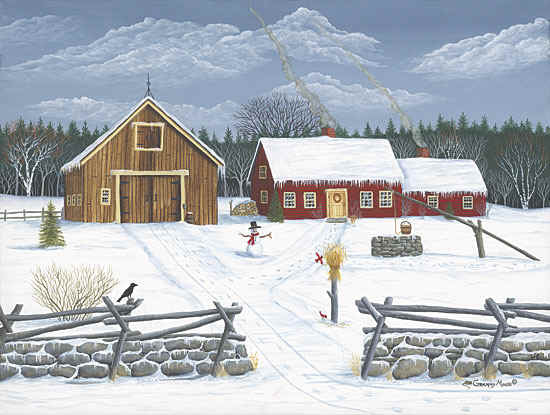 I like to tease my husband (who hates cold weather) that when he’s too old to argue with me anymore, I’m going to drag him to a homestead in Maine where I’ll finally have the cabin of my dreams. Thank you for this new feature of yours, since it will give me something to pine after. I’m subscribing to your RSS feed so I can follow along! 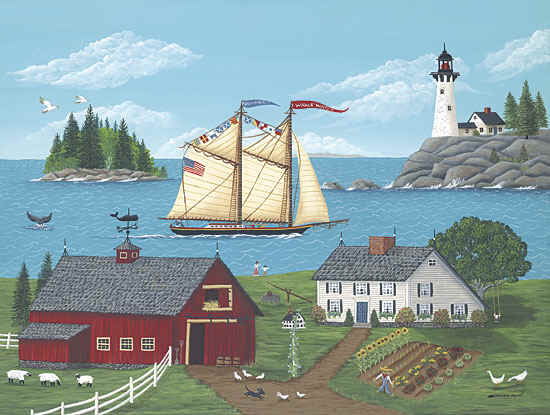 I grew up in New Hampshire but my husband was a union carpenter and that caused us to move around New England a bit. We first lived in Maine for two years back in the 1970’s and I always say it was the best years of our marriage (until now). Maine is so incredibly beautiful and so diverse. Most people think lobster, Kennebunkport, and lighthouses when they think of Maine but there is so much more to it. Pristine lakes, millions of acres of wilderness, mountains, quintessential New England villages…a lot to see and enjoy. How nice to meet you and how absolutely beautiful your pictures are. What a magical place to live. I’m from Colorado and have never been to Maine, but would love to. I look forward to more peeks into your lovely part of the world. Found you at the Grand Social at Grandma’s Briefs. Beautiful pictures… Some of them look like the pictures I have taken around our home in upper Michigan.. We have received around 150 inches of snow in a month, but luckily the sun has come out and some of the last big storm snow is melting.. To get ready for the next. Found you through Let get social Sunday and following you through Linky. Your photos are gorgeous. Maine looks like such a beautiful place. I’ve always wanted to visit. Maybe one of these days . . .
You really should come for a visit. Maine is an incredibly beautiful place with lots to do and see. 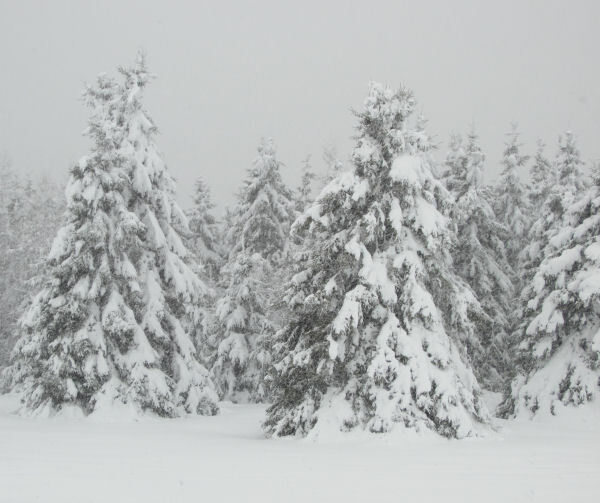 Love all your photos of the snowy woods. Beautiful! Wow, I was bummed that we did not get enough snow (we are so dry). I am not sure we are ever truly happy. At least the snow is gorgeous! Beautiful photos. Wow … It probably gets a little crazy being snowed in that long but it sure does make for some beautiful photos! Your pictures are just spectacular. 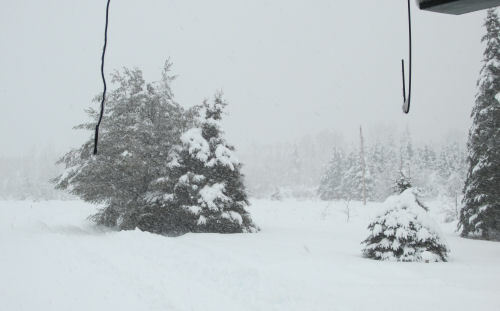 While I hated living in the snow of Michigan it is beautiful — especially the spruce trees all weighed down in it. Just stopping by from the Say it Saturday Linky Party — glad I did. Hope you get a chance to do the same! There’s a lot of beauty under all that snow! Even the snow makes great photos! 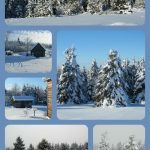 What beautiful winter pictures! Now that is a beautiful winter. Brrrr….I’m not a winter person so this wouldn’t be the life for me. I do however think your shots are lovely. 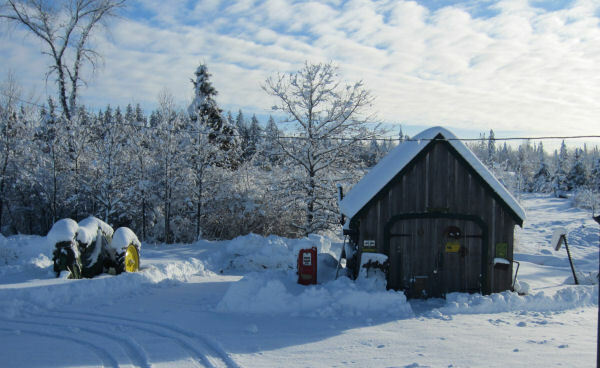 How I love Maine … but have never been there in the winter. Living in Quebec we have pretty much the same big storms and pristine, white vistas. Thank you for sharing! It’ almost like my woods here in Norway. Thank you fro letting me see your part of the world. brings back some great memories. Maine is one of my all-time favourite places on this planet. Can’t argue with that one! It is an incredible place to live! Hi Sheryl, Your photos are beautiful. Maine is such a lovely state. Enjoy your remaining days of winter. Spring will be here before you know it. My goodness, that is some snow! What a beautiful place to live. We used to get some good snows here in West Virginia but over the past 20 years our snowfalls have dwindled away. I enjoyed the visit and look forward to seeing more of Maine’s beauty. 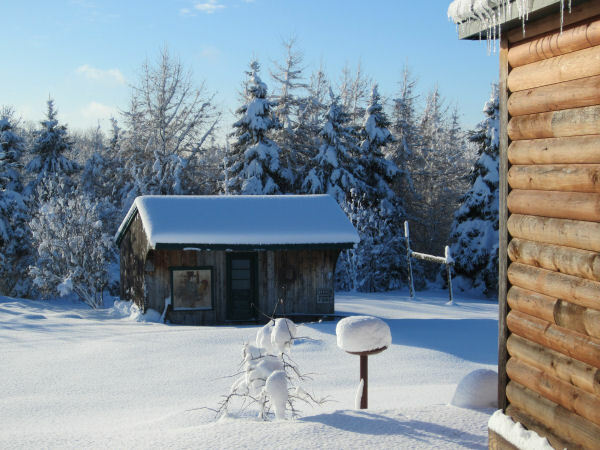 It is incredibly beautiful here….like living in the middle of a Christmas card! These pictures are absolutely breath taking. I know it was rough there for a bit, but my goodness. I would love it if you would share this inspirational post at our WIW Linky party. I hope you can join us! Wow! Sheryl haven’t seen snow like that in a long time. Like the blizzard of ’78. Oops my age is showing 😉 I’ll have to call my cousins in Greenville see if they’ve shoveled out yet! You probably know my cousin John from when you sold art in Greenville. John Morrel, Morrel lumber company? I enjoyed that post very much. I love seeing what the world look like where bloggers live. The pictures were very beautiful and a little surreal to me. It is a very beautiful place to live year round. That’s why Bill and I chose to move here 22 years ago. Stopping by from the blog hop! Your pics are spectacular. All that snow is incredible. wow. You guys got hammered. You get used to it here! But I have to admit that cabin fever is setting in! I love these photos! I grew up not too far from you! Just across the border from Fort Fairfield, ME 🙂 So glad to have stumbled across your blog…. Ah….Fort Fairfield…even further north than we are! This is outstandingly beautiful country! Hello new friend! Stopping by from the Oldie but Goodie link party, and now following you on Pinterest. Doesn’t Maine just find a place in your heart and stay there forever. This is my adopted state but I love it so much!! !